After Midnight's Children's helium giddiness of historical sweep and winning eccentricity, it isn't surprising to find Rushdie giving it another go in this fantasia manner; but now, through force of repetition, the result is far less buoyant. 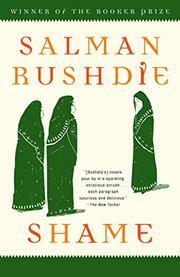 Instead of India, this new novel considers Pakistan--even if Rushdie plays peekaboo as to whether it is or isn't. (Likewise, to rather tiresome effect, he refuses to decide whether to present this as satire or bitter allegory, fact or fantasy.) Iskander Harappa is the Prime Minister we follow, along with his rival Raza Hyder, the President. And the grotesque, brutal, surreal situations applicable to both are continually braided: for instance, while Isky's monstrous, cold-hearted daughter Ironpants is the power behind the power, Raza's crazy daughter Sufiya--Shame--turns from imbecile to an avenging angel of slaughter-filled redemption. The final figure in the tapestry: Omar Khayam Shakil, son of three sisters who claim to jointly share his maternity; he's a fat doctor, a debauched sort, the eventual husband of Sufiya--and an emblem of all that's contradictory and outlandish about Pakistan. So Rushdie takes this quartet of characters through a series of pell-mell incidents, with pointed parallels along the way to the Bhutto and Zia eras of Pakistani leadership. Just like Midnight's Children? Well, yes and no--because this quasi-sequel, unlike its predecessor, seems effortful throughout, flogged on to ever-greater baroque, manic invention and exclamation. A hectic disappointment overall, though of obvious special interest to literarily inclined Pakistan-watchers.